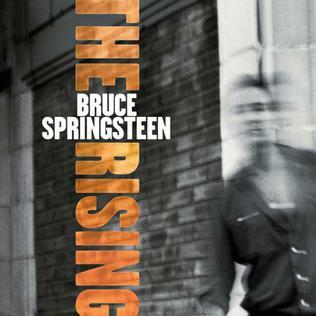 Like the characters in Bruce Springsteen’s The Rising, every New Yorker has a 9/11 story. At 8:46 AM when AA Flight 11 crashed into the World Trade Center’s North Tower, I was at breakfast with a group of business associates at The Coffee Shop, on the corner of 16th St. and University, around the block from my apartment, and just 2 miles from the World Trade Center. By the time the attack caught our attention, we were standing by the bar watching live TV as UA Flight 175 hit the South Tower at 9:03 AM. I remember walking out into the street and staring up at the burning towers that were clearly visible above the stunted skylines of Greenwich Village and SOHO, as groups of people fled the site in panic, up Broadway and through Union Square’s small park. At 9:59 AM, I watched the South Tower fall to the ground, looking in wonder at the remaining tower and the enormous billow of ruble and dust, and trying to understand how it all could have happened. I know I never expected to live through anything like that, and the experience, and its aftermath, come to mind daily. Records indicate that over 2,600 people died in New York in 9/11, over 411 were rescue workers from FDNY (343), NYPD (23), PAPD (37) and local hospitals. Cantor Fitzgerald, a New York-based investment bank, lost 658 employees, one of them the older brother of a very good friend of mine. She was living in CA. I got a call from her the night of 9/11, upset that they couldn’t find him. He had called his mother after the plane hit and told her they were going to try to get out, but Cantor’s offices were on the top floor, above where the plane hit, and the stairwells were blocked off. He was too young (31), leaving a wife and new-born son. Most people pass in private, mourned by their family and friends. The victims of 9/11 passed as part of a national tragedy and an unprecedented act of terror. They are mourned often, by a nation annually and by their families continuously as terrorism remains rooted in the fabric of our lives. Today my office is two blocks from Ground Zero. I can see clearly the progress on One World Trade Center out my window on the 51st floor. It’s expected to be complete sometime in 2013. It’s designed to be a symbol of our will and determination, and our commitment to freedom. I spent the last week listening to The Rising again and again. It’s a great record at any time, but coming out in the aftermath of 9/11 makes it even more vital. It feels like America and its tales of heartbreak and loss, and its never-ending search for possibility and hope. It’s a beginning and a remembering, something we all needed back then, and today, from time to time. This one is my favorite album of the Decade. Nice choice. After spending the last week listening to it again and again I almost felt like I should have picked it as number 1. It sounds even better now than when it first came out. Amen, my brother. This is my No 1 album of the decade. Bruce has defined the decade: from 9/11 to the Obama Inauguration. No-one else.